In 2014, the UN System – working closely with its Member States and other relevant stakeholders – is collectively bringing its attention to the water-energy nexus, particularly addressing inequities, especially for the ‘bottom billion’ who live in slums and impoverished rural areas and survive without access to safe drinking water, adequate sanitation, sufficient food and energy services. It also aims to facilitate the development of policies and crosscutting frameworks that bridge ministries and sectors, leading the way to energy security and sustainable water use in a green economy. Identify key stakeholders in the water-energy nexus and actively engaging them in further developing the water-energy linkages. Water is required to produce nearly all forms of energy. Energy is needed at all stages of water extraction, treatment and distribution. Demand for freshwater and energy will continue to increase significantly over the coming decades. This increase will present big challenges and strain resources in nearly all regions, especially in developing and emerging economies. Choices concerning the supply, distribution, price, and use of water and energy impact one another. Worldwide, 1.3 billion people currently live without electricity, 780 million people lack access to safe drinking water and 2.5 billion people are without sanitation. Water and energy have crucial impacts on poverty alleviation. Better understanding between the two sectors of the connections and effects on each other will improve coordination in energy and water planning, leading to reduced inefficiencies. Policy-makers, planners and practitioners can take steps to overcome the barriers that exist between their respective domains. Innovative and pragmatic national policies can lead to more efficient and cost effective provision of water and energy services. We can all take small actions which will make a difference and conserve our precious water resources. 1. 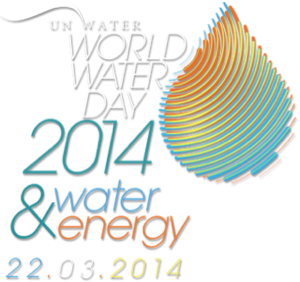 See and share the World Water Day video and read this year’s World Water Day leaflet. 2. Conserving water in the home saves money and reduces pressure on our water resources. 3. Organise a campaign in your community or job using the campaign resources provided here or rethink water use in your organization. Did you find this information useful? Let us know what you are thinking of doing to conserve water?